Creekside at Bonita Bay in Bonita Springs, Florida. 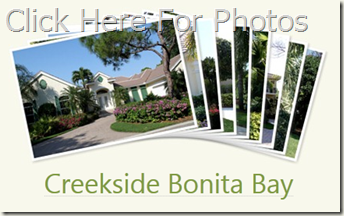 Creekside at Bonita Bay is located at the north end of the Bonita Bay, bordering Spring Creek. Creekside at Bonita Bay subdivision is an upper tier property comprised of approximately one-hundred luxury homes which run along the streets named Pond Apple Ct, Oak Hammock Ct, Osprey Nest Ct, Creekview Dr. and Red Oak Ct. The homes in Creekside at Bonita Bay were built during the time period of 1991-2003. The luxury estate sized lots offer more room between homes with open areas, mature trees and layered landscaping. Homes in Creekside at Bonita Bay vary in architectural style and offer from traditional Florida style cracker homes to classic Mediterranean style homes. Homes in Creekside at Bonita Bay range in size from about 2,900-6300 square feet of interior living space. Each residence has it’s own swimming pool and many homes in Creekside at Bonita Bay also have a private spa, also. Homes in Creekside at Bonita Bay feature views which range from views of Spring Creek to golf course, nature preserve, lake or a combination. Homes in Creekside at Bonita Bay are close to Spring Creek Park and the Bonita Bay walking path system. The walking path system winds its way through the entire community connecting the various internal, community members only parks. Parks inside the gates of Bonita Bay feature canoe launches, boat ramp, tennis courts, playground, bocce, butterfly gardens, nature trails and more. Homes and neighborhoods similar to Creekside at Bonita Bay include Woodlake at Bonita Bay, Bay Woods at Bonita Bay and Hidden Harbor at Bonita Bay.